When using WP-Lister, your WooCommerce catalog will become your “central database” where you should create new products and update existing ones. 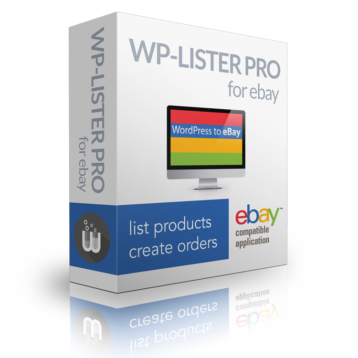 If you want to manually end or relist an eBay listing, this should be done within WP-Lister as well – not on eBay. Generally speaking, you shouldn’t have to visit the eBay website on a frequent basis once you started using WP-Lister. Click on “Revise all changed items” and WP-Lister will start to revise all changed items – which is required to apply your changes on eBay as well. There are two ways to end eBay listings in WP-Lister. On the listings page you’ll find an “End Listing” link next to each published item. Simply click on the link, confirm that you really want to end the listing – and WP-Lister will end it right away. Or select multiple listings you want to end and select “End listings” from the bulk actions drop down menu. You can easily relist all ended listings – just visit the listings page and filter for “Ended” listings. Then tick the topmost checkbox to select all ended items. 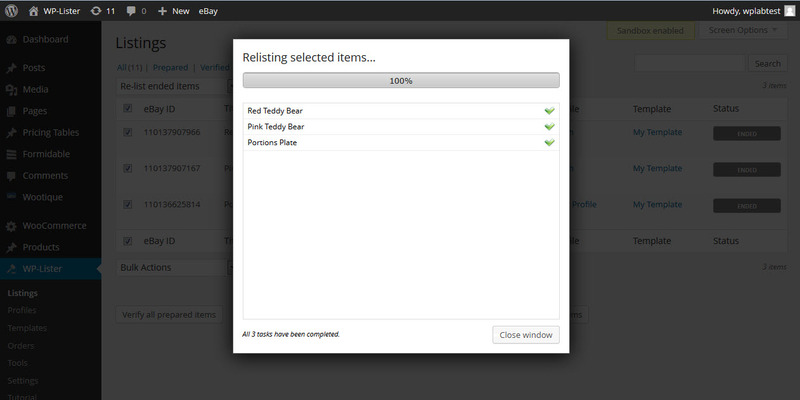 Next select “Re-list ended items” from the bulk actions menu and click “Apply”. Alternatively, you can relist a single item by clicking on the “Re-list” link you will find next to the title of each ended item.